Friends was based on a sketch made by Eyre Crowe in Philadelphia in January 1853, when he was acting as William Makepeace Thackeray’s secretary in America. Crowe’s works possessed much of the sincerity and honesty that characterised the man himself; many of his earlier works being in this respect quite admirable. Such pictures as those he painted at the Blue Coat School and the Quaker’s Meeting, from the simplicity and truth with which the subjects are treated, have a charm about them that, as far as I know, is quite unique in pictures of this sort. One of the most enjoyable pictures here, also one of the richest in character, is Mr. E. Crowe’s Friends (241). Artists will appreciate at a very high rate the remarkable little painting by Mr. Crowe which hangs in Gallery IV, and is styled Friends (241). 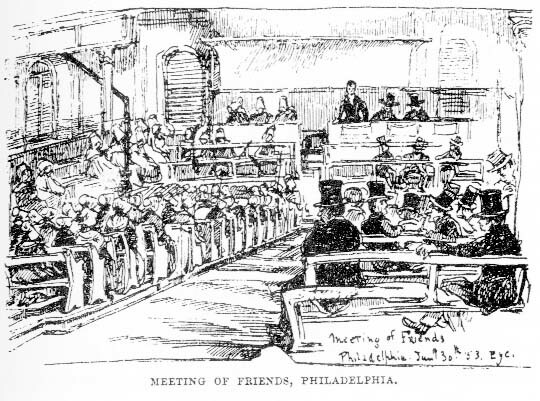 This is a charming, brilliant, sound, and very delicate picture of the interior of a meeting-house of the Society of Friends – the males on one side, the females on the other, and a few on cross-benches, in rows – all clad soberly in blacks, silver greys, drabs and whites. These dresses are so ably brought together, and even the bald, dull interior itself is so wisely treated, that admirable colour is produced. The painting is eminently solid, and the drawing first-rate; and the design is so rich in subtle manifestations of character, that, although only the backs of the greater number of figures appear, and these are quaintly clothed, the work is full of interest, and, for those who can feel it, rich in humour, without a trace of disrespect or satire. ‘Friends’ (241)… is capital in every way. [It] represents a Quakers’ meeting; and although you see only the backs of most of the congregation and the monotonous garbs of the two sexes divided, of course, from each other, yet there is a great deal of subtle discrimination of character, whilst the execution is careful and complete throughout.